LONG BEACH, Calif. —The leader of a private effort to colonize Mars hopes the Red Planet's first few pioneers don't bring children into the world there. 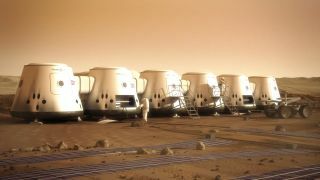 Having kids on Mars would be irresponsible at this point, said Bas Lansdorp, co-founder and CEO of the Netherlands-based nonprofit Mars One, which aims to land four astronauts on the Red Planet in 2023. Doctors have said they don't know if humans can even get pregnant and give birth in the lesser gravity of Mars (which is 38 percent that of Earth), or how fetuses and babies would fare when exposed to the Red Planet's higher radiation levels. Last month, Mars One officials said they would see how pregnant animals fare before considering encouraging human pregnancy on Mars. Lansdorp gave an update about Mars One's plans and progress during his presentation at the conference. The organization plans to land a rover on the Red Planet in 2018 to scout out a good location for the colony. Unmanned modules would follow in 2020 to begin processing Martian soil. These robotic refineries would extract various volatiles, primarily water, for life support and agriculture, making settlement possible. "Once we know it is all working, the first crew of four will go up in 2023," Lansdorp said. Mars One wants to keep sending more crews every two years after that, gradually building up a permanent settlement on the Red Planet. There are no plans to bring any of these pioneers back to Earth. The organization officially opened its astronaut selection process last month, receiving nearly 80,000 applications in less than two weeks. Mars One has also engaged its first contractors, including Arizona-based Paragon Space Development Corp., which has begun preliminary work on life-support systems and pressure suits. “We’re very excited to have engaged our first partners in this venture,” Lansdorp said. Mars One founder Bas Lansdorp discusses pressure suit technology with an MIT professor attending his talk at the Space Technology Expo. Mars One estimates that it will cost about $6 billion to send the first four astronauts to Mars and $4 billion to launch each subsequent crew. It plans to foot the bill primarily by staging a global media event around the entire process, from astronaut selection to the settlers' life on the Red Planet. Some people have voiced skepticism about the project, but Lansdorp remains confident that it can work. "This mission is based on existing technology," he said. "Almost nothing new is needed. And each step is proved before risking lives on the next one." “It’s doable," Lansdorp continued. "But the people I talk to about the money worry about the technology, and the engineers worry about the money," he added with a laugh. While establishing a human presence on Mars will be challenging, Lansdorp said the Red Planet is a natural target for our wandering, adventurous species. "Humans have always explored. We did so for about 10,000 years, then [exploration] slowed down," he said. "The next place to do this is Mars."